Washington’s decision to push Moscow up against the wall over its ballistic missile defense system has increased the likelihood of a pre-emptive nuclear strike and an ensuing war, historian and economic researcher Frederick William Engdahl insists. That threat was dropped some months later when the Obama Administration offered the now-clearly deceptive olive branch of reversing the BMD decision to deploy in Poland and the Czech Republic. ­This time around Washington lost no time signaling it was in the developing game of thermonuclear chicken to stay. No more pretty words about “reset” in US-Russia relations. A spokesman for the Obama National Security Council declared, “we will not in any way limit or change our deployment plans for Europe." The US Administration continues to insist on the implausible argument that the missile defense installations are aimed at a threat from a possible Iranian nuclear launch, something hardly credible. The real risk of Iranian nuclear missile attack on Europe given the reality of the global US as well as Israeli BMD installations and the reality of Iran's nuclear delivery capabilities, is by best impartial accounts, near zero. Two days earlier on November 21, Washington had thrown a small carrot to Moscow. US Undersecretary of State for Arms Control Ellen Tauscher said that Washington was ready to provide information about the missile's speed after it uses up all of its fuel. This information, referred to as burnout velocity (VBO), helps to determine how to target it. That clearly was not seen as a serious concession by Moscow, which demands a full hands-on partnership with the US/NATO missile deployment to insure it will never be used against Russia. After all, given Washington's track record of lies and broken promises, there is no guarantee the speeds would even be true. After the early October Brussels NATO defense ministers meeting, NATO head Anders Fogh Rasmussen said in regard to the nominally NATO European Missile Defense Program, “We would expect it to be fully operational in 2018." Spain just announced it plans to join the US-controlled missile program, joining Romania, Poland, the Netherlands and Turkey, which have already agreed to deploy key components of the future missile defense network on their territories. The last time Washington's Missile Defense "Shield" made headlines was in September 2009 early in the Obama Administration when the US President offered to downgrade the provocative stationing of US special radar and anti-missile missiles in Poland and the Czech Republic. That was a clear tactic to prepare the way for what Hillary Clinton ludicrously called the "reset" in US-Russian relations from the tense Bush-Putin days. However the strategic goal of encircling the one nuclear potential opponent in the world with credible missile defense remained US strategy. Barack Obama announced back then that the US was altering Bush Administration plans to station US anti-ballistic missiles in Poland and sophisticated radar in the Czech Republic. The news was greeted in Moscow as an important concession. Subsequent developments clearly show that far from ditching its plans for a missile shield that could cripple any potential Russian nuclear launch, the US was merely opting for a more effective global system, whose feasibility had been proven in the meantime. In May 2011 the Obama Administration announced that the missiles it would now give Poland consisted of new Raytheon (RTN) SM-3 missile defense systems at the Redzikowo military base in Poland, roughly 50 miles from the Russian enclave of Kaliningrad, a unique piece of Russian real estate not connected to mainland Russia, but adjacent to the Baltic Sea and Lithuania. That puts US missiles closer to Russia than during the 1961 Cuba Missile Crisis when Washington placed ICBM’s at sites in Turkey aimed at key Soviet nuclear sites. The new Raytheon SM-3 missile is part of the Aegis Ballistic Missile Defense System that will be aimed at intercepting short to intermediate range ballistic missiles. The SM-3 Kinetic Warhead intercepts incoming ballistic missiles outside the earth's atmosphere. 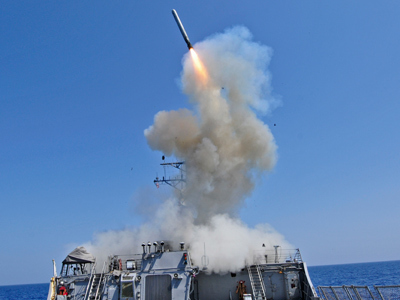 Lockheed Martin Maritime Systems and Sensors developed the Aegis BMD Weapon System. The SM-3 comes from Raytheon Missile Systems. As well Washington has signed an agreement with NATO member Turkey to place a sophisticated missile tracking radar atop a high mountain in the Kuluncak district of Malatya province in south-eastern Turkey. Though the Pentagon insists its radar is pointed at Iran, a look at a map reveals how easily the focal direction could cover key Russian nuclear sites such as Stevastopol where the bulk of the Russian Navy’s Black Sea Fleet is stationed or to the vital Russian Krasnodar radar installation. The Malataya radar will send data to US ships equipped with the Aegis combat system that will intercept “Iranian” ballistic missiles. According to Russian military experts, one of the main aims of that radar, which targets at a range up to 2000 kilometers, will also be the surveillance and control of the air space of the South Caucasus, part of Central Asia as well as the south of Russia, in particular tracking the experimental launches of the Russian missiles at their test ranges. Further, the US-controlled BMD deployment now also includes sea-based “Aegis” systems in the Black Sea near Russia’s Sevastopol Naval Base, as well as possible deployment of intermediate range missiles in Black Sea and Caspian region. But the European BMS deployments of the US Pentagon are but a part of a huge global web. At the Fort Greeley Alaska Missile Field the US has installed BMD ground-based missile interceptors, as well as at the Vandenberg Air Force Base in California. And the Pentagon just opened two missile sites at the Pacific Missile Range Facility in Hawaii. To add to it, the Japan Maritime Self-Defense Force has joined formally with the US Missile Defense Agency to develop a system of so-called Aegis BMD deploying the SM-3 Raytheon missiles on Japanese naval ships. That gives the US a Pacific platform from which it can hit both China and Russia’s Far East as well as the Korean Peninsula. These are all a pretty long and curious way to reach any Iranian threat. That’s clearly why Russia continues to insist on guarantees – from the United States – that the shield is not directed against Russia. Worryingly enough, to date Washington has categorically refused that. Could it be that the dear souls in Washington entrusted with maintaining world peace have gone bonkers? In any case the fact that Washington continues to tear up solemn international arms treaties and illegally proceed to install its global missile shield is basis enough for those in Moscow, Beijing or elsewhere to regard US promises, even treaties as not worth the paper they were written on.